We are off down to Wales later today for my Mum and Dad's 50th wedding anniversary tomorrow. In Canada, one can also receive a message from the Governor General for 50th and 55th anniversaries. The situation is similar in Australia, where one can receive a letter of congratulations from the Governor-General on the 50th and all subsequent wedding anniversaries; the Prime Minister, the federal Opposition leader, local members of parliament (both state and federal), and state Governors may also send salutations for the same anniversaries. In the United States, one can receive a greeting from the President for any wedding anniversary on or after the 50th. So ten years until the Queen has to step up the plate though President Obama would be on the case if we were Yanks. Normal service will be resumed after the weekend. Before I went, I printed out my Amazon wish list in case I could pick some of the volumes on it up. Fat chance. To my jaundiced eye, the necessarily limited range of a physical shop now seems ridiculously narrow. I was particularly outraged by the parsimonious offerings in the philosophy section for some reason that probably reflects badly on me. I settled myself down with a significant Amazon order when I got home. I can't help but wonder if I'm not behind the curve with my attachment to physical books though. E-books outsell hardbacks on Amazon and Amazon has anniunced that its Kindle store has sold over one million digital copies of the books in Stieg Larsson's Millennium Trilogy: "The Girl With the Dragon Tattoo," "The Girl Who Played with Fire" and "The Girl Who Kicked the Hornet's Nest" (Icons passim) making him the first author to make it into seven figures for ebook sales. The Bomber and I took a spin on Boris' new CS7 cycle superhighway on the weekend, and I confess to being very impressed, and entirely comfortable with my nine year old navigating it which is not something I can generally say about cycling on the road. There's a TFL online cycling route planner now (here) and the London bike hire scheme launches this week, so it is all action on the two wheeler front. Cardiff as ever appears to be in the lead though, if more modest, with bikes available as near to Bronwydd Avenue as Roath Park Rec. Evelyn Hamilton, women's professional cycling champion gives cycling tips - covering fashion and safety. M/S of Evelyn having her legs massaged. She stands up and stretches her arms. She is wearing a revealing bikini. It is a truth universally acknowledged that a girl of a certain age, and in a certain situation in life, must be in want of a right hook. There is an almost irresistible steampunk brio here. I'm finding myself spending more and more time with viral videos. If we think of time as orthogonal to space, a stream-based, time-based Cybersphere is the traditional Internet flipped on its side in digital space-time. The traditional web-shaped Internet consists (in effect) of many flat panels chaotically connected. Instead of flat sites, where information is arranged in space, we want deep sites that are slices of time. When we look at such a site onscreen, it's natural to imagine the past extending into (or beyond) the screen, and the future extending forward in front of the screen; the future flows towards the screen, into the screen and then deeper into the space beyond the screen. It dawned on me, as the lights dimmed for the screening of Salt, that I have never actually seen noted baby-hoarder Angelina Jolie DO anything. Except hoard babies ..
Reading Lindy West on the new movie "Salt" this morning, it struck me how many of the writers who make me laugh lately are women. A little further research into this new release having revealed that Ms Jolie trained muay Thai under the supervision of the action director has left me pondering what a long shadow Icons passim throw over what little I manage to take in from all that streams by me. 25. If we think of time as orthogonal to space, a stream-based, time-based Cybersphere is the traditional Internet flipped on its side in digital space-time. The traditional web-shaped Internet consists (in effect) of many flat panels chaotically connected. Instead of flat sites, where information is arranged in space, we want deep sites that are slices of time. When we look at such a site onscreen, it's natural to imagine the past extending into (or beyond) the screen, and the future extending forward in front of the screen; the future flows towards the screen, into the screen and then deeper into the space beyond the screen. That is a posh way of describing something we've done for launch next week. Watch this space. I have officially heard Jay Z and Alicia Keys enough times to last me the rest of my life, though it is watching the video just once more to see just how clever the Newport version is. We are trapped by assumptions that unravel as soon as we think about them: "we" meaning not only laymen but many philosophers and scientists. Here are three important wrong assumptions. Many people believe that "thinking" is basically the same as "reasoning." But when you stop work for a moment, look out the window and let your mind wander, you are still thinking. Your mind is still at work. This sort of free-association is an important part of human thought. No computer will be able to think like a man unless it can free-associate. Yet we each hallucinate every day, when we fall asleep and dream. And when you hallucinate, your own mind redefines reality for you; "real" reality, outside reality, disappears. No computer will be able to think like a man unless it can hallucinate. Many people believe that the thinker and the thought are separate. For many people, "thinking" means (in effect) viewing a stream of thoughts as if it were a PowerPoint presentation: the thinker watches the stream of his thoughts. This idea is important to artificial intelligence and the computationalist view of the mind. If the thinker and his thought-stream are separate, we can replace the human thinker by a computer thinker without stopping the show. The man tiptoes out of the theater. The computer slips into the empty seat. The PowerPoint presentation continues. But when a person is dreaming, hallucinating — when he is inside a mind-made fantasy landscape — the thinker and his thought-stream are not separate. They are blended together. The thinker inhabits his thoughts. No computer will be able to think like a man unless it, too, can inhabit its thoughts; can disappear into its own mind. I give you DAVID GELERNTER's DREAM-LOGIC, THE INTERNET AND ARTIFICIAL THOUGHT. Read it at least a couple of times. Courtesy of the Grauniard, I learn that the new Tom Jones album is available for preview for free at http://www.we7.com/#/album/Tom-Jones/Praise--Blame. What do we think? Praise or blame? It's no use asking me, I think everything he does is great. P.S. I have never previously heard of http://www.we7.com/. I ticked a lot of boxes yesterday by going to the Strawberry Hill Music and Fun Day in Twickenham. 1. Exercise. I cycled over and back, getting my cardio for the day done in the sun. 2. Socialise. Met up with a lot of old friends I don't see enough. These days a shirtless Dommy is eerily reminiscent of the Iggy Pop puppet in the Swiftcover TV advert. 3. Food and drink. "This is a song for anyone who has been drinking all day. It's about drinking all day, and its called ...... Drinking All Day" announced Duncan McManus of the Biblecode Sundays. 5. Contributed to a good cause, supporting the restoration of Strawberry Hill House, Britain's only Gothic castle. See serendipitous Icons passim. The washing machine that came with the house when I bought it has finally given up the ghost, so I went along to Curry's to sort out a replacement yesterday. At first I couldn't find any fitted machines at all as they were in a completely different part of the shop to the bog-standard ones. Then when I finally discovered and chose a suitable model I was told it couldn't be installed until August 19th, so I just gave up on the whole thing and sulked. This - in short - is why I found myself in a launderette first thing this morning for the first time in twenty odd years. There was a notice on the wall saying that the machines only took the "new 50p pieces". These new coins came out in 1997. So little had changed from the ambience that I remembered that I found it rather soothing to sit there for forty minutes or so reading ancient Mail on Sunday "lifestyle" supplements and reminiscing. I used to do my washing lunchtimes on Sunday, so long ago that in those days the pubs only opened from noon until 2pm, and I'd sit in the Nelson with the boys for a pint or wto while my smalls revolved in water then hot air a little further up the road. Prodnose: YouTube phenom Justin Bieber has nabbed the honour of having the most-viewed YouTube video of all time from Lady Gaga’s “Bad Romance” capturing 245,746,720 views for his vid “Baby ft. Ludacris.” against her 245,570,952. Myself: The Shallows: How the Internet is Changing the Way We Think, Read and Remember draws on the latest research to show that the Net is literally re-wiring our brains inducing only superficial understanding. As a consequence there are profound changes in the way we live and communicate, remember and socialise - even in our very conception of ourselves. By moving from the depths of thought to the shallows of distraction, the web, it seems, is actually fostering ignorance. 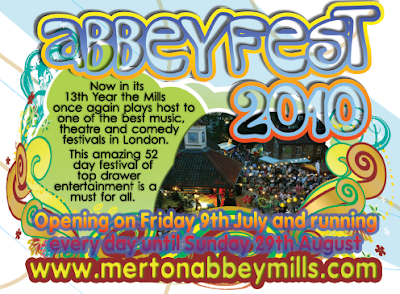 The second Jazz Friday of Abbeyfest has rolled around already. I was talking to Mark at the first last week and telling him how much we enjoyed the promenade performance of Romeo and Juliet last year that took the production all round the Mills and the Chapter House. He said that he hadn't managed to sort out anything similar this year, but that he would have liked to do Cyrano de Bergerac. I've had pretty much the same thought as there are so may scenes like the opening at the theatre, the baker, the cadets etc. in which the audience could actually "play" the production's in situ spectators. There is also, of course, the issue of my own - currently moribund - translation. The upshot of a booze fuelled discussion is that, if I can finish it by around next March, they'll do my version here in 2011. I lost my copy of the new Prince album when it was given away with the Mirror on Saturday, but now - due to some "Tlön, Uqbar, Orbis Tertius" type disruption in the space-time continuum - I appear to have two copies in my gaff. The stand out is a hidden track; number 77. That's right it comes after sixty odd brief silent efforts. The easiest way to get to it is to go back from track 1. I ripped it to a PC and tried adding it to the "local" files in Spotify thinking that would give me access to it from wherever I ran the app, but no luck so what then is the point of this feature? Catch Laydown on YouTube while you can. Our original (2006 vintage) XBox 360 has long gone kaput, but it seems to me that the new slimline, wireless XBox 360 S plus the "controller-free gaming and entertainment experience" provided by the Kinect (previously Natal) looks like a must for Christmas. Young men from the Basque Country arrived in Elko in the 1870s to work as ranch hands, and now dedicate themselves to serving food whose quality is matched only by its quantity. On our first night we make the amateur's mistake of ordering a meal each, only to be defeated by a perfect filet mignon the size of a baseball mitt, incredible lamb steaks larger than most sheep, and side dishes which might elsewhere be mistaken for swimming pools. Ramblin' Jack [Elliott] did not acquire his nickname because of a penchant for long walks: in nearly an hour onstage, he gets around to three songs, including Dylan's Don't Think Twice, It's Alright. The rest of the time is taken up with a tangent-riddled anecdote about teaching his dog to drive. It contains not a single punchline, and is one of the funniest things I've ever heard. It occurs to me to ask Ron what line of work he's in. "Well, Andrew," he says, in that punctiliously courteous way Americans have of employing your name as if it's an honorific, "right at the moment, I'm chief justice of the Nevada Supreme Court." I cycled 22km on Saturday with the Bomber, another nine year old, and another adult. The overwhelming majority of it was along the Wandle Trail which is a designated bike path, but - I hold my hands up - on at least a few hundred yards of it the kids cycled on the pavement. They're not officially allowed to do this, but I heard on the radio on the way to work this morning that the Mayor and the Met are thinking of changing the rules to permit it. This is just common sense. The fallout from a child on a bike accidentally colliding with an adult on the pavement is trivial compared to the potential consequences of an adult in a car hitting a child on a bike in the highway. I am also - as you may imagine - in Boris J's camp when it comes to kids cycling to school. Further - hat tip Chris - I add that all Welsh eyes should be following Cardiff's Geraint Thomas in this year's Tour de France. In 2007 I got a new Prince album with the Mail on Sunday. Yesterday I got a new Prince album with the Daily Mirror. I listened to the first couple of tracks in the car, but when I got home I put the CD down somewhere and now I can't seem to find it again. The Bomber got his fourth mon at judo on Thursday so he's now a yellow belt. At first he only thought he was going to be playing uke on someone's else's grading so it was a nice surprise when Darren tested him out as well. A marker like this every four months or so is a good way of evaluating and rewarding progress, and there are 18 mons altogether, so that will be plenty to keep him occupied while he is a junior. We're off for a cycle this afternoon along with his mate Jonnie, and Jonnie's dad Andy as the four of us are doing the Richmond to Windsor bike ride with Bondy et al later this year. It would be good if I could get him to comb his hair or take a shower from time to time without having to resort to threats of blood curdling violence but overall things are pretty good. The only real mistake I've made lately is to expose him to my - admittedly very fine - Yoda and Obi-Wan Kenobi impersonations. Has lead him, this has to demand like the Jedi master I speak to his friends to my toe-curling embarrassment. David "Fight Club" Fincher has directed a new movie written by Aaron "West Wing" Sorkin. It's a story about the founders of the social-networking website, Facebook. It is scored by Trent Reznor. That's enough cognitive dissonance for one morning. I am going for a lie down. It gets stranger. Here is the founder of Facebook shooting the video conference breeze with the Prime Minister, as posted by No10 on their YouTube channel today. Paul, an octopus in a German zoo who predicts the national side's football results, maintained his 100 per cent accuracy rate at this World Cup by foreseeing the team's downfall at the hands of Spain. His keeper, Oliver Walenciak, said before the match: "We know that all octopus have nine brains so we know he has exceptional powers. Paul's unwavering accuracy this year has even seen him become a target for furious Argentinian fans, who blamed him for their side's quarter final defeat against Germany and threatened to eat him. Spillers is the oldest record shop in the world! I never had an inkling. Let's bend the rules a little and elevate a shop to the rank of Welsh Born Icon. As we're in the neighbourhood be sure to catch "What good am I?" - a profile of Lord Jones of Treforest, on the BBC Iplayer while you can. In the year 2000, an English heritage blue plaque commemorating Mr John Brodie, who died at the age of 76 in 1934, was unveiled on the late Victorian detached villa he had occupied in Ullet Road, Liverpool. He invented the football goal net. "After he witnessed a near riot at Everton's Goodison Park stadium when nobody could agree on whether the ball had actually crossed the goal line. He perceived the value of attaching a net to the goalposts to catch the ball: the result was a "net pocket", patented by Mr Brodie in 1889." On the day of the first World Cup semi-final, we may all pause to reflect that perhaps "goal line technology is not so new after all. A star cast in a timeless comedy. Affably absent-minded Earl of Emsworth, preparing his prize-winning pig Empress of Blandings for the Shropshire Agricultural Show, is afraid that rival pig-owner Sir Gregory Parsloe is planning to nobble his precious Empress. Parsloe fears that Emsworth's brother Galahad's memoirs contain scurrilous stories about their younger days in the naughty 1890s - particularly a racy story involving some prawns. He plans to hire private detective Percy Pilbeam to purloin the manuscript. Emsworth's sister Lady Constance, equally desperate to stop publication, also has a secret plan. And romance is in the air. His Lordship's new secretary and Emsworth's niece Millicent are secretly in love, but need financial help to pull off the marital merger. Emsworth's nephew, Ronnie Fish, is also in love with an unsuitable person - chorus girl Sue Brown. But Emsworth refuses to allow Ronnie any more money. Ronnie concocts a plan to regain his uncle's approval. Pig-napping, private detection, impostering, mistaken situations, fisticuffs and broken engagements ensue. All is set for glorious mid-summer mayhem. I went along to the British Museum's Kingdom of Ife exhibition yesterday with the vague idea that sculptures from West Africa may throw some light on the African mask that I bought from our auction site back in 2004. All the exhibits were brass, copper, stone or terracotta with no stylistic kinship with the mask at all as far as I could tell, but they were extraordinary works and well worth a visit. I was also surprised that they generally seemed to be portraits from life rather than the stylised images I was expecting. I love every minute Marvin Gaye committed to vinyl with the exception of "The Onion Song" which I hate as much as I hate "Dignity" by Deacon Blue and "Big Yellow Taxi" by Moany Jitchell. I had a meeting in the Chinese Dining Room today. An interesting companion piece to the meeting in the Yellow Drawing Room last February: See Icons passim. Prodnose: The Chinese Dining Room? Myself (as if to a child): Its just another name for the Pavilion Breakfast Room. (Muttering under breath) God give me strength!